aGupieWare: Space Station Sunday: Awards Season! As reported on www.nasa.com, Allyson Thorn of NASA's International Space Station Research Integration Office spoke at this week's International Space Station Research and Development Conference in Chicago, stating, "This will be an exciting decade for the space station as we continue to learn more and turn ideas into opportunities, results and plans for humanity's future." Research from scientists in twelve US states, Japan and Russia was analyzed and awarded distinction. 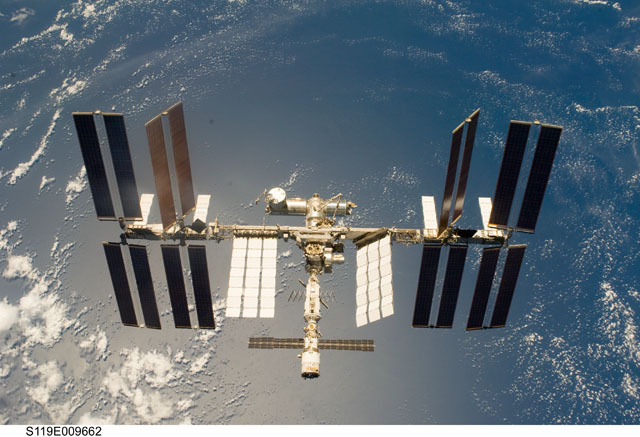 Categories of the ISS-specific awards included Most Compelling Discovery, Biotechnology, Health and Education, Engineering Development and Technology, and Discoveries In Microgravity. "Most Compelling" results included recognition for research regarding microgravity's effect on immune responses and heart function during spaceflight. This is very nice information we also provide online education and also spred so many information of different types of medias so get enrol and get information and take education online also, Pacific Cambria University Website this is online university provide online education in nation wide.